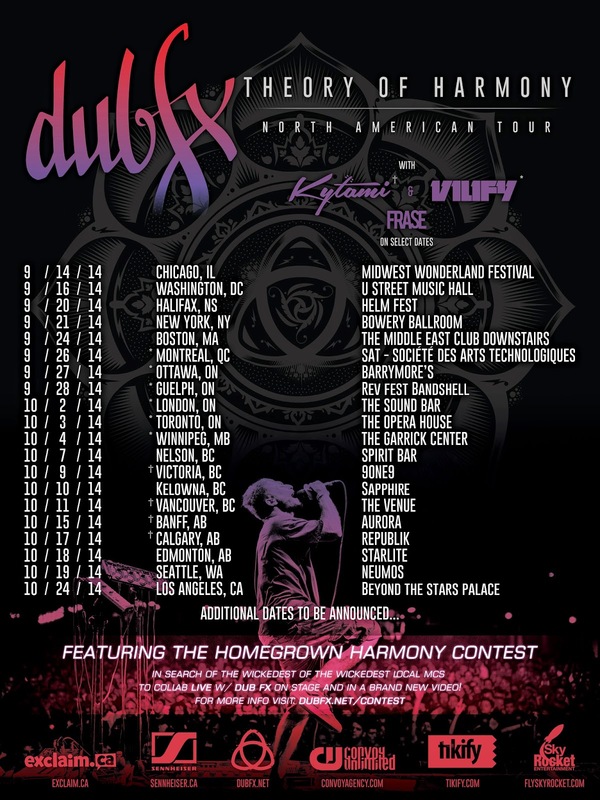 Dub Fx [worldwide street performer and studio recording artist] will be returning to North America to tour his latest album The Theory of Harmony. Taking the ideology of the album to heart this tour is a working Theory of Harmony model, featuring the very bold Homegrown Harmony Contest where locals in each city along the tour will be chosen to participate in a “pass the mic” session LIVE on stage during each show (dubfx.net/contest). A Dub Fx show is nothing like anything you've ever witnessed; it is a raw experience which cannot be reproduced or summarized, a very special circumstance which everyone becomes a part of. This brand new tour is already well received by sold-out shows across Europe over the summer and is slated to kick-off in Chicago on September 14th. Select dates will also feature VILIFY, FRASE and Kytami on the bill for the night in addition to the local contest winners. Dub Fx is supported on tour by our sponsors; Exclaim!.ca, Sennheiser and TIKIFY. Publicity articles Featured on DJMag here, and MixMag here. This tour is produced and managed by Convoy Agency & SkyRocket Entertainment Agency. 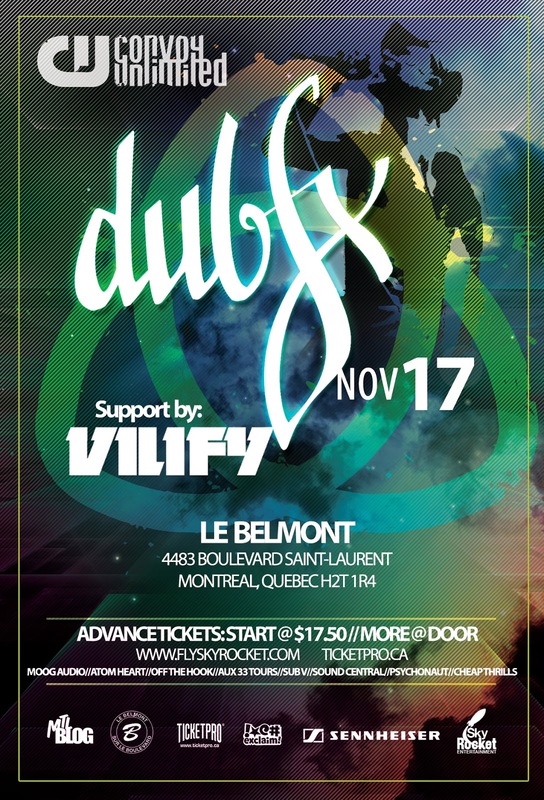 Sunday night amazingly packed and full of energy shows do not happen very often but if you have a line up at Le Belmont with Ragers, Vilify and none other than Dub Fx it is impossible that it cannot become a reality. Big ups to Skyrocket Entertainment for bringing Dub Fx to Montreal and to Le Belmont for hosting a magical evening. Smiles were seen for miles, not one unhappy soul from what we saw. Enough rambling, on to the epic set of pictures, check these out Montreal. Pre-Show: We look forward to seeing you all back at the legendary venue, Le Belmont on Sunday November 17th, where Dub Fx, Flower Fairy & CAde originally performed to a sold out crowd in 2011, and where DJ VILIFY has presided over Bass Drive Wednesday’s, which have consistently been awarded for being the best club, night and experience year after year. These circumstances will make for one very special, intimate Sunday evening. Fans and press are eager to see and hear new material from the over-crowd-funded (130%) incredible success that has been the Dub Fx Pledge Campaign for The Theory of Harmony Album, due to be released in December. For those of you who enjoyed last years’ secret street performance that shut down St Denis street, keep an eye out around town this week, you may see a familiar face on a random street corner, drawing in crowds of people to share in a moment of music. 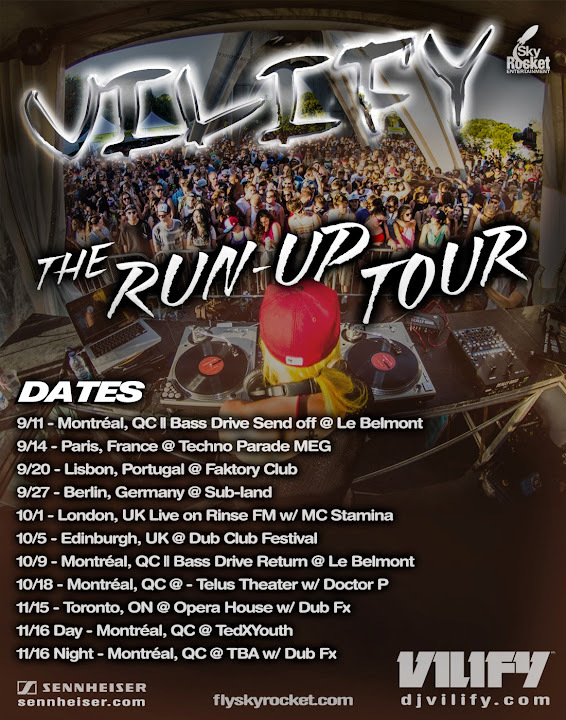 VILIFY is touring Europe with the support of Sennheiser behind her and a fresh mix of new tracks, this tour will see her go from Montreal, to Paris, Lisbon, Berlin, London and Edinburgh all before heading back home for one night with Doctor P, some Bass drive and then two nights with Dub Fx, in Toronto at The Opera house and Montreal Le Belmont. After watching VILIFY blow up the crowd at Technoparade this year in Paris, France, if you can't be at one of her live performances, you'll want to make sure you tune in for her live set on Rinse FM October 1st with MC Stamina. 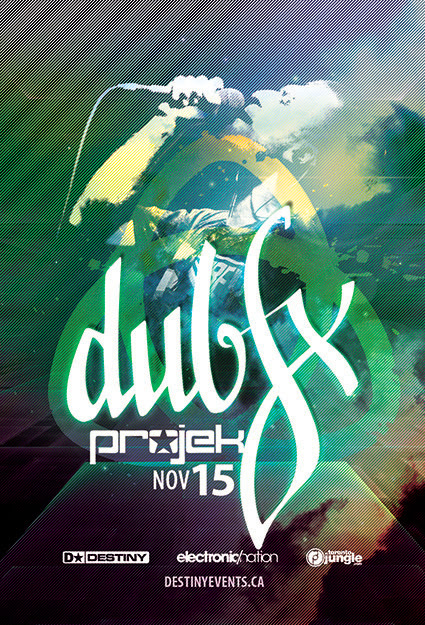 Dub Fx will be coming to Toronto on 11/15/13 @ The Opera House, supporting the Dub Fx Theory of Harmony Pledge Campaign. For anyone who's seen a Dub Fx show anywhere across the world, you know the ambiance of the Opera House venue, beautiful sound and acoustics of the room, this is sure to be one night you'll never forget. The night will also feature support from VILIFY and HYDEE. 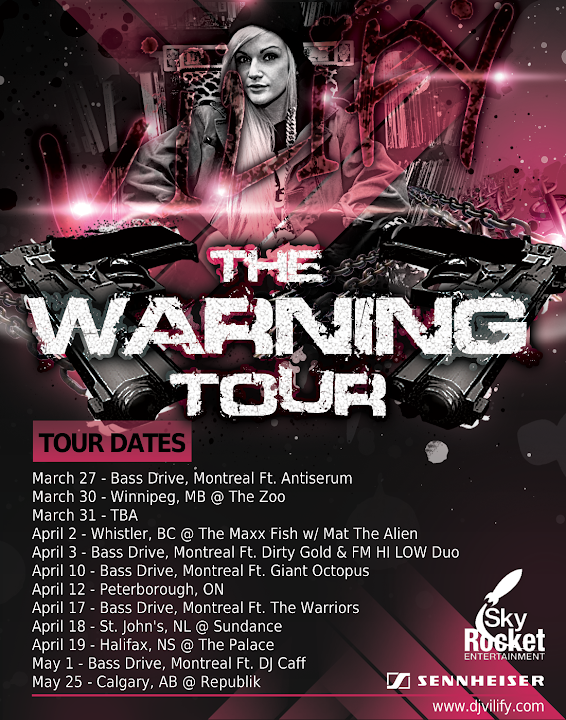 DJ VILIFY's, The Warning Tour, will see her travel from Coast to Coast while making her way back to home-bass in Montréal to host her weekly Bass-Drive on Wednesday's. Jenny, VILIFY, is proud to be supported by Sennheiser on this tour; as she moves on to global markets this year will see VILIFY back overseas in Europe so make sure you check out one of these tour stops while you still can. Dub Fx will be hitting North America like an armageddon raining down fiery performances all across Canada and the United States - Continuing from their tour through Europe and the UK. 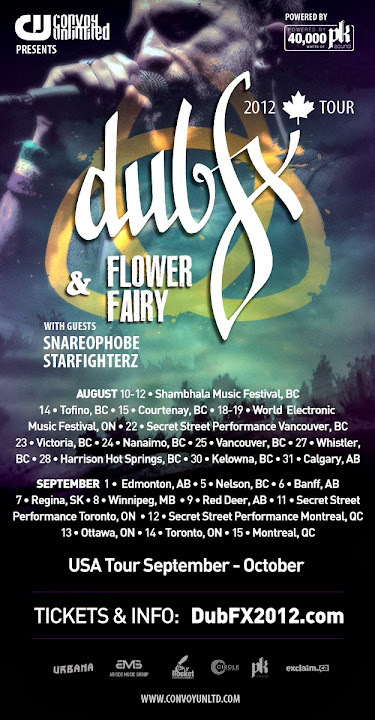 The tour starts in Canada with two major festivals - Shambhala Music Festival and WEMF (The World Electronic Music Festival) - and moves East, the final Canadian date set for Montréal, QC. From there, they head south of the border into the US where the tour continues through the end of October. The Dub Fx 2012 Tour is slated to be one of the biggest Canada has ever seen and will feature Dub Fx & Flower Fairy with guest performances by Snareophobe and Starfighterz; 2011 saw Dub Fx's first foray into the North American markets with a completely sold-out Canadian tour and demand for more performances from this street busking legend rising. This years' tour will see performances in a number of different settings; From festivals to concert halls and intimate clubs and yes... even three (3) Secret Street Performances - in order to catch one of the Dub Fx Street Performances beyond just being in the right place at the right time, it may help to be following on FaceBook and Twitter (#dubfx2012) as they'll be dropping clues through-out the tour. We've also partnered up with Exclaim! (Canada's largest independent music magazine) to provide a once in a life-time contest opportunity for a few lucky fans to win some very cool prize-packs through exclaim.ca along with helping us promote this tour and spread the word of good music all around. - Exclaim TV covered the Toronto event last year. This years biggest shows outside of the festivals will be held in Calgary and Edmonton by True Rhythm (also hosting the Banff event), Toronto and Vancouver by Electronic Nation and Destiny Events, with the grand finale in Montreal handled by the highly anticipated arts endeavor Urbana Festival. Head over to the Touring Dates page for links to specific FaceBook events and Online Ticket sales outlets now! This past Thursday (January 19 2012) none other than our favourite DJ Vilify headlined The Marquee Pub at Sheridan College in Oakville, Ontario spinning nothing but Dubstep, Drum’N’Bass, and HipHop. Even though it was a college event, she packed the Pub with more than just students in their Tight and Bright gear. With the help of Noise/Ruckus starting the night off right, the raging was in full effect as Vilify dropped into a two hour set of epic proportion. The bass pumped through the crowd with thanks to a sound system that made sure you felt every beat. We’re excited to meet up with Vilify for some urban electronic music at her weekly event, Bass Drive Wednesdays. Including both local and international guests, it takes place in Montreal, Quebec at Le Belmont featuring Drum’N’Bass, Dubstep, Grime, Street Bass, Ragga Jungle, Breakcore and more. 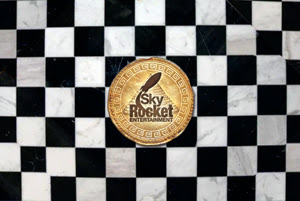 Keep an eye on SkyRocket Entertainment for your chance to see her back in the GTA soon!